Beth Rubino, the Set Decorator for Something's Gotta Give and It's Complicated. And we got her!!! The Academy Award nominated, Set Decorator extraordinaire Beth Rubino sat down at the Skirted Roundtable to talk about - you got it - Something's Gotta Give, the popular Nancy Meyers film which starred the beautiful Southampton beach house as much as any of its Hollywood actors! But, the surprise was on us. It turned out that Beth Rubino is far too a fascinating and intelligent a woman to be pigeonholed by just one movie, despite the fact that we want her to be. Beth is full of stories about the movie industry and what her job as Set Decorator entails. We get Beth to discuss the famous beach house with its even more famous blue and white rug - which she tells us all about. And we got Beth to tell us the secret of exactly where the inspiration for the house came from - especially the much beloved dining room with its wall of white ironstone. We discuss fellow blogger - Annechovie aka the artist Anne Harwell. Harwell's famous chair painting was in the movie "It's Complicated," Nancy Meyer's latest blockbuster! 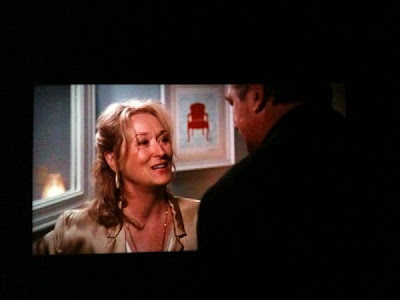 Anne's chair painting can be seen behind Meryl Streep in the infamous pot-smoking bathroom scene. Congrats Anne!!! The Concourse Level of the Twin Towers designed by Beth Rubino for the movie World Trade Center. But life as a Set Decorator is not all beautiful Southampton beach houses. In Oliver Stone's "World Trade Center," Beth was challenged to recreate the concourse level of the Twin Towers. 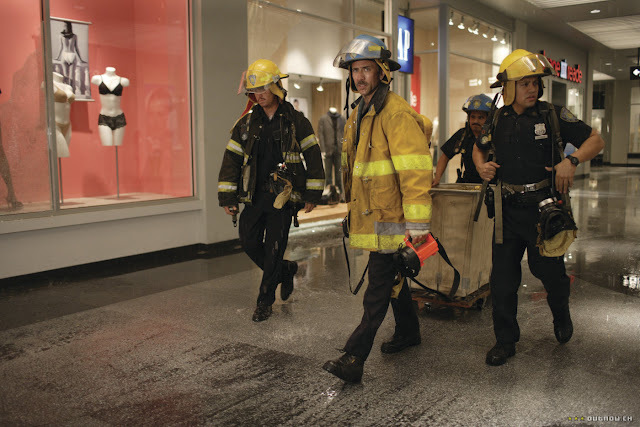 Beth describes for us what happened the day the invited first responders came to visit the set. Please join Linda, Megan and Joni as they talk Hollywood and the most famous movie house ever with the woman who designed it, down to the last glass in the kitchen! You do NOT want to miss this one!!! Not sure which I liked better - the movies or the houses. Since "It's Complicated" is still fresh on my mind, all I can say is that house was fabulous! I kept getting distracted in following the plot of the story because I was thinking...seriously, why would she want to change the house!? What a wonderful way to spend the morning with my first cup of coffee ~ listening to this very interesting interview ~ loved it for so many reasons! Great interview ladies...my son's girlfriend is specializing in set design, and I can't wait to share this podcast with her. Thanks!! So interesting, I was not surprized by the idea that the floor would be paper, movies are fake...fake at it's best,right? ..and good on you to use what ever you can. Fantastic Ladies. Going to see that movie tomorrow. Wonderful interview! 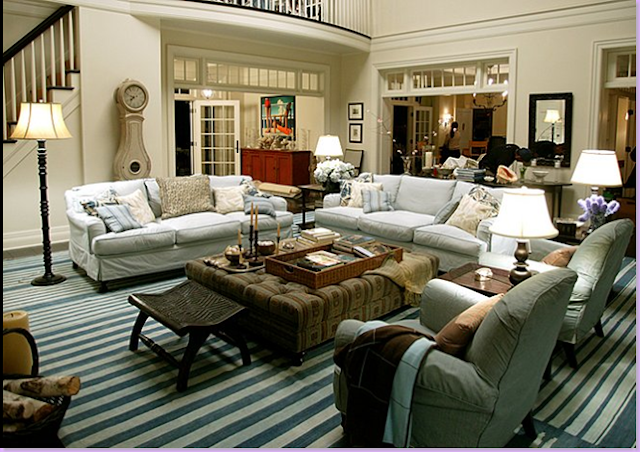 When the "Something's Gotta Give" set was in Architectural Digest several years ago I saved it for a long time, then ripped out the set pictures and tossed the rest! I was so surprised when I found it was a set and the pool was only a few feet deep! Did anyone notice the person in the back of the dining room in the living room picture? I think it's a person! Wonderful interview!!! You are great! Thank you, thank you, thank you!!! Oh, I just want to curl up with a glass of wine and family & friends in that living room - Now I will go see the movie. Thanks! Too funny Joni, literally 30 seconds prior to you saying, "Ugh, I wouldn't want to do that", I actually said aloud,"I don't think I'd like do that." However with your love of research, I would venture to say you would be great on the team of a set designer. Egads! Fin Juhl or Sears? I know where on want to be in that situation...how quick can you say Chieftain?! That was incredibly informative. I so appreciate period films and value the talents and abilities of the people who look after all those details, it was so interesting to hear about the process. Btw, I loved Original Sin and had no idea Ms Rubino was the set decorator...I think I thought it was just organically gorgeous...I guess that means it was a job well done;) Thanks again! I love that Beth's formal training education gave her such a formidable background. I can appreciate her desire to want to live a lifestyle commensurate with NY. Her sets are artistic, friendly and visually pleasing. So fun to see Anne Harwell's artwork too. Thanks for making my day! I listened to the interview twice. Good Job. There was a person in the DR. Interesting interview. I wish she had spent more time talking about the set designs for SGG and It's Complicated rather than other movies and the World Trade Center. A fun listen! VERY Illuminating on the whole set design process - what I wouldn't give to be one of her assistants! Thanks so much. Y'all did it again. 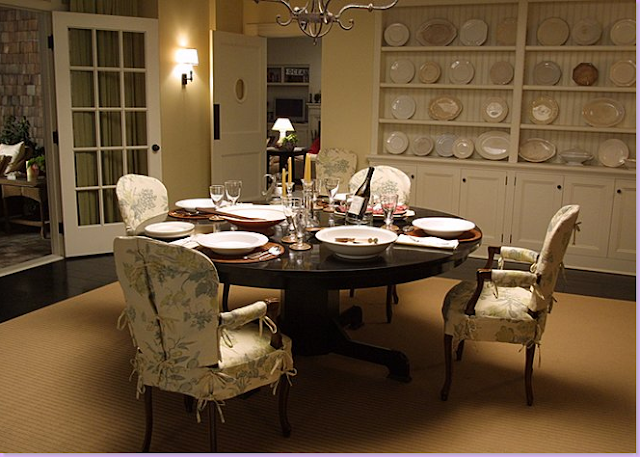 If a career for the detail minded person was tailor made, it is that of the set decorator! Beth is so old Hollywood. In the old days the actor's underwear was as important as the exquisite costume and set design. Original Sin is one of my favorite movies and I never paid attention to who did the outstanding set decor! I finally had a chance to listen to this very enjoyable interview. It's so good to hear about all the other crazy people who were also obsessed with the interiors. I was one of those people who also had to buy the VHS (and player) version so I could pause it exactly where needed to analyze each detail!!! This is SO great... I've learned a ton and I find it all so interesting from the décor's intrinsic value to an actor's artform to the source of inspiration for the rooms, and more and more. Just great gals!! Thank you. What a great talk,..... loved this one! Not only a beautiful set designer of homes but the NYC tradecenter and yards of set design. I think it sounds like the ultimate challenge and what a wonderful job! Sounds like a great way to be creative, artistic, historically correct and feeling the set vibe all in one! Listened to this again having now seen the movie - so wonderful. In It's Complicated the set (of the house) helped define Meryl Streep's character so much and helped add a layer of depth as to why she was still so attractive to her lovers (apart from being gorgeous Meryl Streep. The layering in her house showed someone who had lived, had a variety of interests, had family, was a mother, a successful business woman and so on. The other thing I must comment on was how GORGEOUS that bakery was - my goodness - it was stunning! Is there any way to contact Ms. Rubino? I have a question regarding the set on "Original Sin" that I've been dying to ask her! 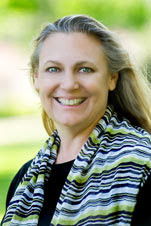 Marcheline - if you wanted to email me your question, I can pass along to Beth. Thank you for posting this terrific interview! I'm a latecomer to the blog, but better late than never. Your posts are inspirational. I, too, think the decoration from "Soemthing's Gotta Give" is a dream. Six years after the film, I've not yet seen interior decor in a magazine or movie that I like more. Thank You!! Great interview! I remember one of my very first blog posts was about Movies sets that inspire me. Something's Gotta Give was one of them. I was brand new to blogland and I had no idea every other design blog had written about that house too. I also wrote about Marie Antoinette. I loved It's Complicated and also Mrs. Potter. I watch and rewatch Something Gotta Give, It's Complicated, and Marie Antoinette any day I just want to veg-out inside and be inspired. Thanks for the interview ladies!! We all love you!